Last Monday was National Chicken Cordon Bleu Day, and though I wanted to have my recipe posted for you, life didn't work out for me. However, I did make my Chicken Cordon Bleu that night, and I can't wait to share it with you now! Then, in a shallow dish, combine the panko bread crumbs,crushed crackers, tarragon, salt and pepper. Yes, in this picture I used Saltine crackers, but that is because I grabbed the wrong kind at the store. Either will work, but I prefer the flavor the Ritz. In a second shallow pan, combine the egg and mustard. Next, take the chicken breast and,, using a paring knife, cut a pocket into the thickest side of the chicken breast. Make sure that you do not cut all the way through to the other side of the chicken breast. Now take two slices of the ham, and set them, overlapping, on the counter. Now place some of the shredded swiss cheese on the ham, making sure that you will be able to roll it up. Then simply roll the ham and cheese up into a cigar. Place the ham and cheese cigar into the pocket you cut into the side of the chicken breast. Then press down on the top and side to seal the seam. I forgot to photograph this step, but then you will need to season the chicken with salt and pepper on all side. Now roll the chicken breast into the corn meal. I realize most people would use flour here, but I really like a crunchy crust on my Chicken Cordon Bleu, so use corn meal instead. Then roll it in the mustard and egg mixture. And lastly, roll it in the cracker and bread crumbs. Next place it on a baking sheet that has been lined with foil, and sprayed with cooking spray. Next place it in the 450 degree oven, on the bottom rack, for 10 minutes. Next, reduce the temperature to 375 degrees, move to the middle rack in the oven, and cook for 25 more minutes until the internal temperature reads 160 degrees. Remove from the oven, let rest for 5 minutes are you are ready to eat! 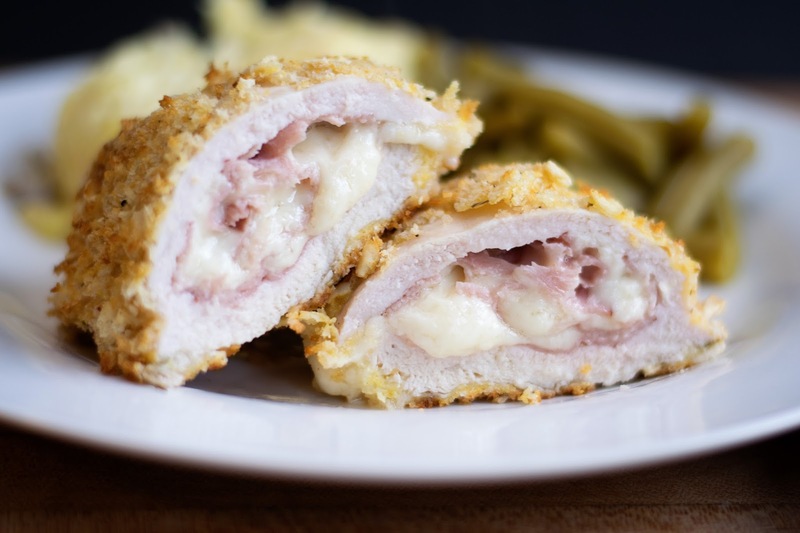 This Perfect Chicken Cordon Bleu is crips and crunchy on the outside, but moist and juicy inside. And can we talk about that filling for a second? The saltiness of the ham with the gooeyness of the cheese. OH.MY.WORD! This is heaven. I like to serve it with mashed potatoes and green beans, but this with a simple side salad would be nice as well. 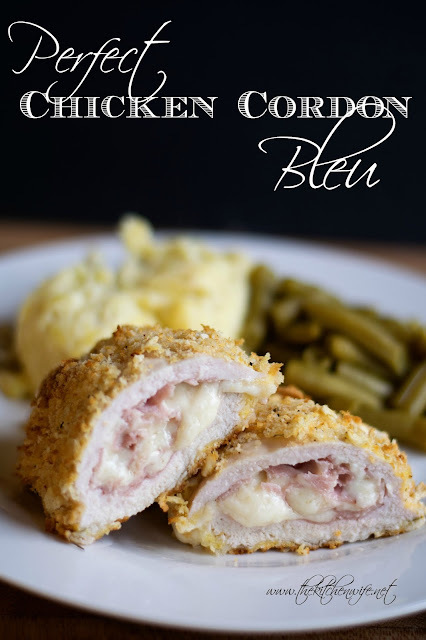 So if you're wanting to jazz up tonight's chicken dinner, give this Perfect Chicken Cordon Bleu a try! Get three shallow pans. In one, place the corn meal. In the second, place the eggs and mustard. In the third, place the crackers, bread crumbs, tarragon, salt, and pepper. After that, cut a pocket into the thickest side of your chicken breast, being sure not to cut all the way through to the other side. Now place two slices of ham on the counter, overlapping. Then add some of the Swiss cheese on top of the ham. Roll the ham and cheese into a cigar shape. Place the ham and cheese cigar into the pocket of the chicken breast. Press down on the chicken breast, being sure to press the seam close. Roll the stuffed chicken breast in the corn meal. Next, roll the chicken breast into the egg and mustard mixture. And finally roll it into the cracker and bread crumbs. Place the breaded, stuffed chicken breasts onto a baking sheet that has been lined with foil, and sprayed with cooking spray. Place into the 450 degree oven, on the bottom rack for 10 minutes. After 10 minutes, reduce the heat to 375 degrees, and move it to the center rack. Cook for another 25 minutes until the internal temperature is 160 degrees. Somehow you have managed to make this look easy! Great recipe. I worked at a cafeteria in college and every other Sunday was Chicken Cordon Bleu. It was the most popular day of the week and we almost always ran out! My husband has been begging me to make it and I guess now I really have no excuse. You can do it! It's one of those dishes that sounds WAY fancier than what it is! Ohlalala ! i need to make this for my honey, he loves chicken and cheese, i'll have to surprise him later. YES!!! I can't wait to hear what you think! My Dad used to make this so often when I was growing up! You've taken me down memory lane. I don't think he used cornmeal though - so I'm going to send this to him to try your version. I used the corn meal for the extra crunch on the breading. I really liked how it turned out, but of course you can totally use flour. And I love how a recipe can connect us to the great memories of our childhood. We don't eat meat any more, but this used to be a favourite when we did. Such a classic dish! This looks so good and worthy of a dish served to company. I can't even remember the last time I had this...I think it's time to make it. Thanks!! Awesome recipe Mandee. This does look "perfect!" Haha! Thanks so much Pam!